When your father last visited, he took you past the front yard at your grandparents’ house and sat beside you on a square of sidewalk. 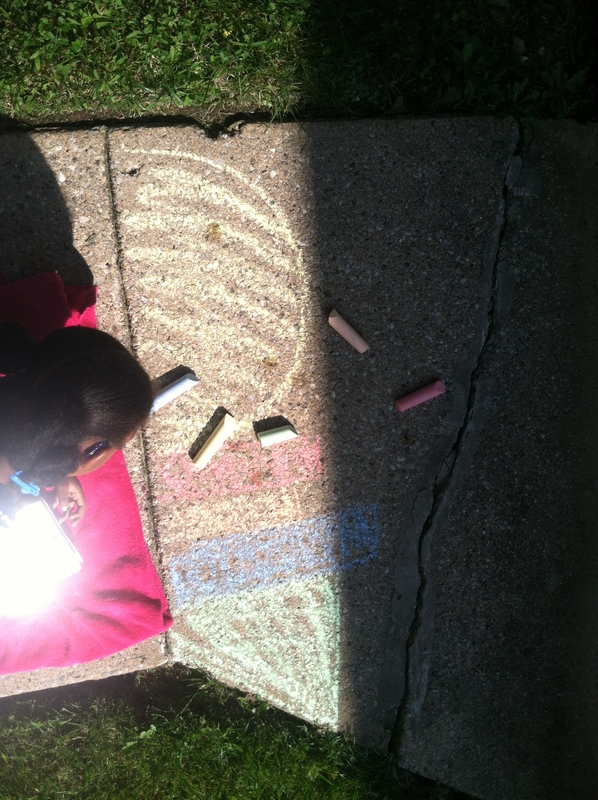 I had supplied the chalk — $0.75 on sale in the checkout line at a supermarket — but stayed at home both to relax and to give you two space and time to bond. Your father is big like Mike Brown was. At 6’5″, his walk has heft, his forearms are a bit like boulders, and whenever I think of him making sidewalk drawings with you in the cool of an afternoon, I am newly amused. He sent me pictures of your handiwork, your name emblazoned in a multicolored blast. For you, the sidewalk became a concrete quilt. For you, it told the story of a family. For now, this is all it needs to tell you. For now, this is just as it should be. You won’t know this for at least a year or two — we have not started to read books like Henry’s Freedom Box or Freedom on the Menu; you have not heard of Emmett Till, have not seen what it seems that every black child must: his bloated, disfigured face in an open casket — but someday you will understand just how many of our horror stories begin and end with sidewalks. Whether stepping off of them to let a white man pass or refusing to cross to one on the other side of a street in order to clear a white woman’s path, sidewalks have never been entirely inanimate for us. Our teeth have been broken against them. After tussling unarmed on one, Trayvon Martin was accused in court of using a sidewalk as a weapon, just before his blood was splattered across it. And even now, with no particular law in place to compel us, some confess to still ceding the sidewalk for white passersby, in spite of ourselves. 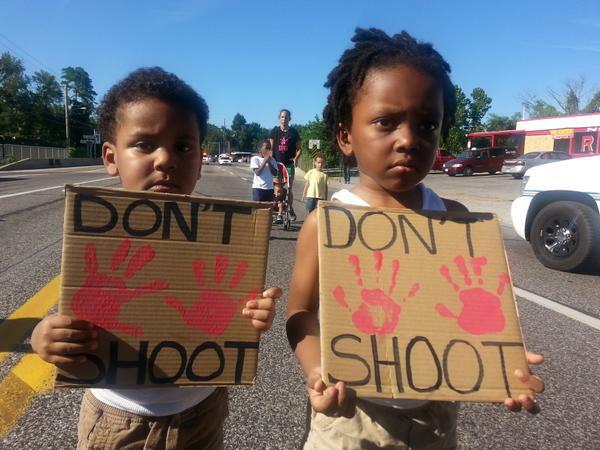 It is said that the boy in Ferguson was killed because of a sidewalk. The officer who shot him, his anonymity still being carefully guarded even six days later, is said to have told the boy and his friend to get the f–k on the sidewalk. According to Dorian Johnson, the friend who survived, he and Mike Brown were walking in the street, a practice you will someday find is quite popular in sleepy suburbs. When no cars are in view, a street may be a scooter lot, a skateboard park, a strolling path. Preferring the street to the sidewalk is not uncommon for adolescents. Here in Baltimore it is not uncommon for grown folk — even if cars are barreling toward them. Baltimoreans play fast and loose with their lives when traveling on foot. But in the 25 years I’ve lived here, no one has ever lost his life at an officer’s gun-wielding hand for crossing against traffic. These days, the policing of black pedestrians while simply walking down empty streets or on the adjacent sidewalks, is no longer en vogue. What happened in Ferguson, Missouri on Saturday is an anomaly, one that hearkens back to a time so many of us believed we had left far behind. But when the boy’s long untended body was whisked up from the street and taken away to be autopsied (to withheld or suppressed result), the town was left grieving on sidewalks. Eventually, the crowds took their grievances into the streets. And we were all swiftly reminded of what it must’ve been like for our elders to have been “put in their place” on the sidewalks of streets across the nation. We knew what it was to be shouted down, to be threatened with capture, detainment, canine attack, to be herded onto sidewalks as though we were cattle (or chattel). Yes, in just a few years, you will know all about our complicated history with sidewalks in this country. And it will become quite clear how quickly something as simple as a sidewalk can get you killed. But it is not yet time and for that, I am exceedingly grateful. For now, just let the sidewalk be a site for sunshine, a concrete kaleidograph of shapes. Let it be what it hasn’t be for the children of Ferguson since Friday: a safe haven, a play yard, a shore. → Iceberg Boys: On Michael Brown and Other Lives Cut Short. Amazing piece of literature. You inspire me everyday. Actually, I found her daughter hyper-intelligent and charming and I would have enjoyed to have some play dates, but it took an hour of warmth and friendliness and overt giving of toys and attention for her mom even to let me talk to her daughter, and when I told her that I’d like to take them to the science center, and asked for her moms number, she cracked up and said, “Oh, Like were gonna be friends and go to Starbucks together?”. Owch. That one experience was so bizarre and vastly disturbing, being treated as if I am someone who will harm a child, but covered in this sort of tongue in cheek uber-respect, that I talked to all my friends about it. Finally one friend let me know that the experience of racism to children, the constant dismissal, the subtle body language that says “You are black. I don’t want you around my kid. I don’t want you touching her toys. You are OTHER and you are not good.” Is so damaging and painful that most parents go far out of their way to protect their children from those racist experiences. I never saw racism as a feminist issue, but it is, isn’t it. After being told that, when we were walking home in Butchers Hill, there were some well dressed, adorable kids sitting on skateboards and rolling down the street. My husband, an avid skateboarder, said in jest “Hey! You guys are doin it the wrong way!” He was trying to get a rapport going, but they reacted as if they had been hit or something. The got off their skate boards immediately, The boy said “My Uncle lives here!” and ran away. I then recognized that as them reacting to previous racist experiences, and them perceiving the statement as a scold “You’re BLACK, You can’t ride your skateboard here. Get out of my town!”. I followed them gently and talked to them about skateboarding until they were both smiling and got them back playing on their boards, before we continued walking. But I saw that this one unintentional statement and action had robbed them of their self-esteem and joy for the day, and I was crushed. We did that to them without meaning to. So here is the thing that really bothers me, now. I was at a restaurant outside and a girl came up and asked me for the time. When I picked up my phone to tell her, she grabbed the phone but then dropped it. So I jumped up and reached for it but she pushed me down, grabbed the phone, threw it to a 6 yr old (ish) boy with a flat top and the sides shaved and they ran off in different directions. UNfortunately I was wearing my daughter and she hit her head on the concrete. It was terrible. The was much pouring of blood from the head of a 9-month-old baby and it was horrible. She will always have a scar, and she could have died. Just because this teenaged girl wanted a phone. They caught her because she came back the very next night, with several kids, to do the same exact thing to someone else. And now this event, because it is an assault, will have a lot of consequences for her future. This whole situation. From the grandfathers that step off the street and bow their head to me, the thief-girl whose parents are distracted with poverty or drug problems or both, to the well-meaning and well taken care of boy in my alley. Hurts me. I’d like to request a piece (at some point) on what actions someone like me can take to make things a little bit better. I was really excited to move into a neighborhood that is so diverse and stably integrated. I can live with a poor teen making a stupid choice that hurt me and my child. I can’t live with having suspicious or negative feelings towards a child simply because of their skin color. Also, Hi Meghan, Wow — thank you for your brave, long comment and your awareness of how badly our privilege needs to be checked and unpacked–and ideally, dismantled through our own conscious actions every day (I am white). And also for your honesty about how hard this is, in the moment, on a day to day basis. I think you have said some important things. Perhaps you yourself could be a person to write publicly about your complex experience–of course, with a lot of thought, reflection, and some reading eyes to respond to drafts. I speak to you as a fellow traveler. I am always trying to improve. I’d be glad to talk with you via email some more about your observations. As I am a writer, perhaps I can read drafts and help YOU be the agent for “…a piece (at some point) on what actions someone like me can take to make things a little bit better.” And maybe you’d link back to Ms. Brown’s piece and say it is a response from a white woman who wants to help change this world for all our children’s safety. Don’t get me wrong here–I know such writing would take time, much thinking, much revision, and with a young baby in a new city I am sure you have limited time. But it is clearly important to you. And it is increasingly up to us people with white privilege to educate one another and share this burden–in fact, especially for white women to make up for years of burdening women of color with telling the story. Also, Hi Meghan, thank you for your brave, long comment and your awareness of how badly our privilege needs to be checked and unpacked–and ideally, dismantled through our own conscious actions every day (I am white). And also for your honesty about how hard this is, in the moment, on a day to day basis. I think you have said some important things. Whew. Such a powerful piece of writing. It should not be this way. it cannot be this way, but… our American society has a great big flaw in it, one we love to sweep under rugs and pretend like it isn’t there, so unfortunately, it is. There should be justice for Michael, but it is a fear the nation will judge that A sufficient result when it is but a beginning. I don’t know how many Fegusons are out there, but I’m sure there are many. I do know Michael and Trayvon are two names we know from revent events, names that are hardly exclusive even this month, this year, and backward through time. The demographics of Ferguson and its government are sufficient proof something is horribly askew and need of fixing. Thank you for sharing your magnificent story with all its raw pain and joy; it is in the stories we can connect together, and come together across multiple cultures to change this country into one where all people feel safe on the sidewalk. Stacia Brown, I keep returning to this essay. I am working on transportation and pedestrian rights in Washington, DC and your article is a template for me as I begin to articulate the intense value of shared space and freedom of movement for all people around sidewalks, street corners, intersectins, and the like. Thank you thank you thank you! This is a marvelous essay that I will cite and carry forward in working on better and more just access to public space for people of color, and as I continue to work against anti-Blackness and white supremacist structures. I thank you! What a powerful and profound missive. The stroll through our history. The remembrance. 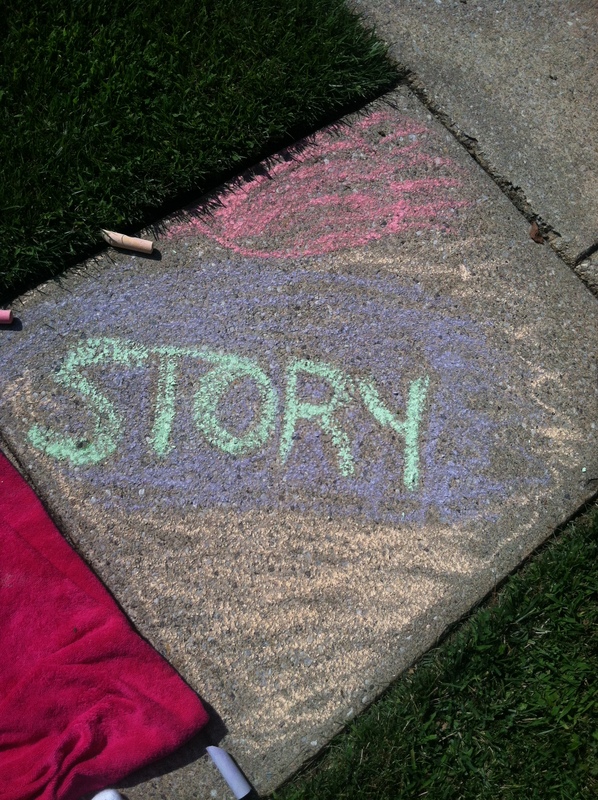 We once used chalk to draw on sidewalks. Sidewalks were a place for play. Now sidewalks remind us of a large and looming pain. Chalk is used to mark fallen bodies. and to play a bigger, legal game. I will never forget Mark O’Mara during the George Zimmermann trial. As you refer to and also remember in his final plea to the jury, he entered the courtroom carrying a large slab of concrete and claimed he did not wish to be “dramatic.” At the time, he mused that if he were to be “dramatic” he would drop the sidewalk…Oh, how sidewalks are used to set the blame stage. As is consistent with our beliefs and tradition EmpathyEducates will include all attributions and hot links to the original. EmpathyEducates acts for equal and equitable [formal and informal] education as an inalienable human and civil right. It is our Mission to expand the conversation and create an appreciation for the commonweal… http://empathyeducates.org/who-we-are/empathyeducates-mission/ We are grateful for the countless whom also serve the vision. EmpathyEducates is neither a for-profit nor a not-for-profit. We labor for love and to further the vision. We have never asked for; nor do we make even a penny on our endeavors. We truly work for love of the greater good! We are Educators and active participants in curation and learning. Thank you for your kind words and your request. You have my permission to republish this post in your site. Dearest Stacia L. Brown…I am elated and honored! Brief History of Black Folks and Sidewalks is truly a powerful, poignant, and memorable piece. I will send you the link once complete. Again, I offer my sincerest thank you! To have permission to share your missive is an honor. “A Brief History of Black Folks and Sidewalks” speaks volumes. Currently, I am reading Slavery By Another Name…There are no words, only more pain. For as long as I can remember I have been intensely aware of the cruelty we inflict on our brethren. I wish I understood why. As a third generation peacenik ….I Sigh.